During our regular research for potential link partners we find all kinds of interesting things. We find really great resources, really funny pages, neat articles, and basically a lot of information we never knew before. 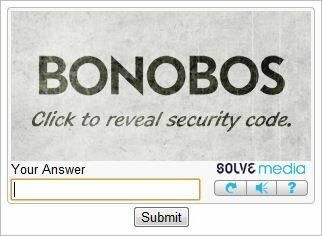 During the course of her efforts, my chief link builder discovered a new kind of captcha that I guess I missed when it first launched. I suspect some others may have missed this too which is why I thought I would point it out. 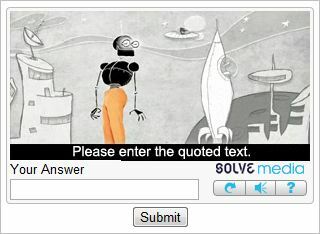 The new kind of captcha forces you to engage with an advertisement in order to get your captcha code. Frankly it’s brilliant. Annoying, but brilliant. 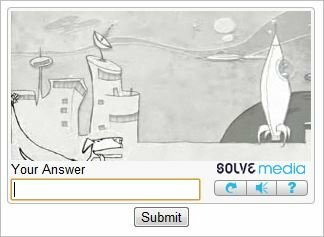 The company which launched this cool idea is called Solve Media (SolveMedia.com). According to Solve, their ads (compared to non-interactive static ads) increase brand recall by 111% and message recall by a factor of twelve. That’s pretty significant. For more you can check out their white paper and look at examples ads on their site. As an internet marketer I think this kind of advertising is a double-edged sword, at least for now. On one hand, it really does reinforce brand and message recall, but on the other it annoys the living daylights out of some poor sap that just wants to submit a comment form. Since brand recall is so high, and message recall is typically linked to the emotion elicited by the message, a user who is annoyed and inconvenienced by an advertisement may go away with a sour taste for the brand. There are some kinks to be worked out with this new form of advertising (as shown in my screenshots below) but I think they really might be on to something here. 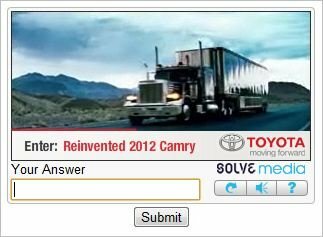 This type of captcha ad makes the user watch a short video, typically 15 seconds, to reveal the captcha solution. 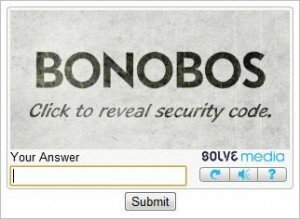 A shot taken during the Bonobos captcha video advertisement. The unfortunate ending to the Bonobos video ad. 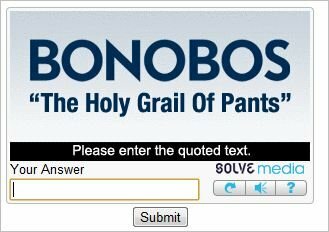 There’s no captcha solution here. This is a much better, much less inconvenient ad which gives you a quoted brand message in an image which is the captcha solution. This video ad for a Camry is executed well. It’s a high quality video with the caption solution apparent throughout the message. 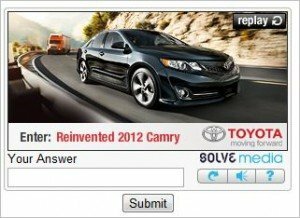 The captcha solution for the Camry is displayed the whole time.